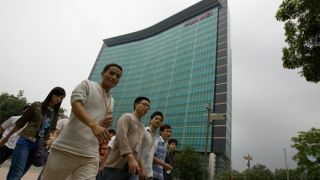 Update: Despite the hoopla, Huawei wants to be clear that there are no concrete plans to pick up Nokia at the moment. Speaking with Reuters, Bill Plummer, Huawei's vice president of external affairs, said the phone maker "has no plans to acquire Nokia." That doesn't mean the company isn't considering it or, as Huawei's Richard Yu said, open to it, so we'll continue to keep an ear to the ground to bring you all the latest. Nokia's commitment to Windows Phone 8 hasn't been doing the Finnish company's bottom line, or its stockholders, any favors. Even with impressive offerings like the Lumia 925 and possible upcoming devices like the Nokia EOS, the company's shareholders have been pleading with CEO Stephen Elop to change paths quickly. As Android and iOS continue to dominate the marketshare for smartphones, Nokia's decision to go all-in with Microsoft's fledgling operating system could prove to be too much for the company to handle for much longer. While there's still time for Nokia to turn things around, it's going to need some luck and a lot of help, a silver-lining situation considering Huawei may be willing to lend more than just a helping hand. According to the Financial Times of London, Huawei is open to the idea of acquiring Nokia to help further its own interests in Europe and the U.S. Currently, Huawei is holding onto a third place slot in phone shipments in its native China behind Samsung and Apple, and could potentially use Nokia's smartphone prowess to become an even bigger threat globally. "We are considering these sorts of acquisitions; maybe the combination has some synergies but depends on the willingness of Nokia," Richard Yu, chairman of Huawei's consumer business group, said during a launch event for Huawei's Ascend P6. "We are open minded," Yu told reporters in attendance. The buyout would naturally have to happen with Nokia's blessing. However, Yu made it sound as though Huawei may scuttle aside Windows in favor of Android, something Nokia's shareholders may just flock to. The chairman even went so far as to call the mobile OS "weak," both as Nokia and Huawei use it. "Whether Windows Phone [will be] successful is difficult to say – it has a very small market share," Yu said. "[Windows Phones] are weak but still require a licence fee. That's not good. Android is free." He also said that Huawei wants to get out of the feature phone space, focusing on next-gen smartphones that still come with at a reasonable price. This is hardly the first time buyout rumors concerning Nokia have surfaced, with Microsoft, Lenovo and Intel all reportedly having thrown their hats in the ring at one time or another. Elop is very much still in support of Windows Phone 8, but the rest of the world isn't (yet) quite as enthralled as he seems to be with the OS. Nokia's stock jumped up as high as 11 percent on Tuesday when the news broke Huawei might take the company over, but it could soar even higher if some actual confirmation came from either manufacturer. We've reached out to both Nokia and Huawei for comment on the potential of a sale, and will update this story when we learn more. Nokia may be right to stick to its guns, as research shows Windows Phone 8 is growing (slightly) faster than Android.